Welcome to our hot rod shop, HOUSEOSPEED where you'll fine the coolest hot rod stuff on the planet. Stickers, patches, t-shirts and soft goods from the finest lowbrow artists on the planet. Almera, Bigtoe Joe, Coop, Dirty Donny, Forbes, Kozik, Kruze, Norwell, Pigors, Pizz (RIP), Sailor Jerry, Tuck, Vince Ray,Von Franco and Zombie, we've got 'em all. Cool artist such as Saari Design baby blankets, and Liberty Garage kid's bibs, and Tiki t-shirts. Exclusive merchandise from HouseOSpeed, and our newest offshoot, Vinvanco a.k.a. Vintage Van Company. 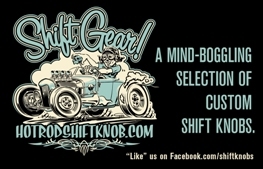 Hot rod, custom and lowbrow books and magazines and all sorts of other assorted hot rod, custom and lowbrow goodies like baby blankets, not to mention kids clothing, custom shift knobs and jewelry, too. Have a look around. Whether you're a fan of hot rods, customs, or lowbrow art, you're sure to find something special for that someone special, even if that person is you. And if you're looking for a custom shift knob, visit our sister store Hot Rod Shift Knob for a huge selection of made-in-the-USA shift knobs.